A few of the locals dressed in period attire. Back in 2010, we went to Edo Wonderland after visiting the Nikko Tosho-gu Shrine. One side of a bridge. It rained that day and the park was pretty empty but we still had a good time. One of the theaters, I think. We saw a ninja show and a traditional water show that you could photograph (non-flash) while you watched. They actually encourage you to. However, I didn’t like any of the photos I took. It’s a cool place if you’re in the neighborhood with the family. Taiko drums signal the park is closing. Samurai nobles to bid us a safe journey on our way out as the park closes. A colleague posted an article about Adam Magyar, a photographer, on Facebook this week. 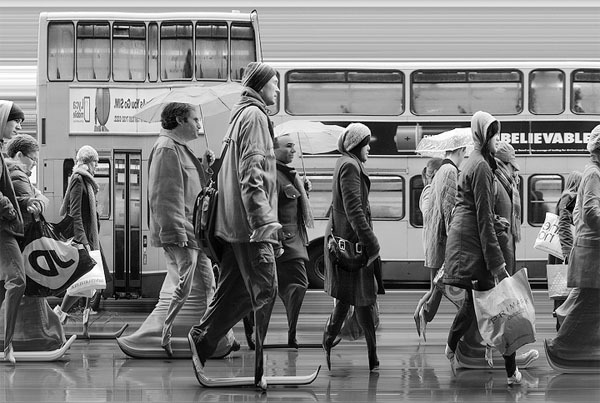 Without getting too nerdy and technical on you, the article explains that Adam Magyar has invented a new way of capturing images. His camera scans images in a matter of seconds. Digital Art at it’s purest. The slow motion video is pretty mesmerizing. Watch it here. Here’s a video of Adam explaining the technology behind his videos. If you’ve followed the last blog I’ve posted. You know I’ve started the year on a grim but important subject matter. Suicide. In last week’s post I mentioned a previous post about the Suicide forest and people in the documentary mentioned a best-selling book (in Japan) called the “Suicide Manual”. The manual is supposed to accurately depict the various and painful ways someone can kill themselves efficiently and the painful side effects if they don’t do it properly. My wife recalled, during her high school days, one of her instructors actually encouraged her class to read this manual. Nothing would peak a teenager’s morbid curiosity more than a book about suicide. For my wife, it stripped away all the romanticism behind what people think they know about suicide. Now I have a copy of my own. Sorry kids, you must be over 18 to read about ways to kill yourself. Taboo subject matter is always fascinating to me and suicide is another universal phenomenon I think everyone has encountered in one way or another. However, not talking about it won’t make the problem go away. If anything, this book will spark some interesting dinner conversations and hopefully remind us that maybe that’s really what need sometimes… Communication. I don’t want to start this year on a morbid subject but watching this documentary compelled me to share it. If you have 50 minutes to spare watch this documentary. It’s different from the VICE documentary about the suicide forest I blogged about in June. I think we’ve all been touched by suicide somehow. Some more than once. And it’s never an easy thing to talk about or cope with. You can feel the filmmaker’s passion an urgency on this universal subject. Everyone hits a low point somewhere in their life. How do we help them pull themselves back up? How do we help ourselves?